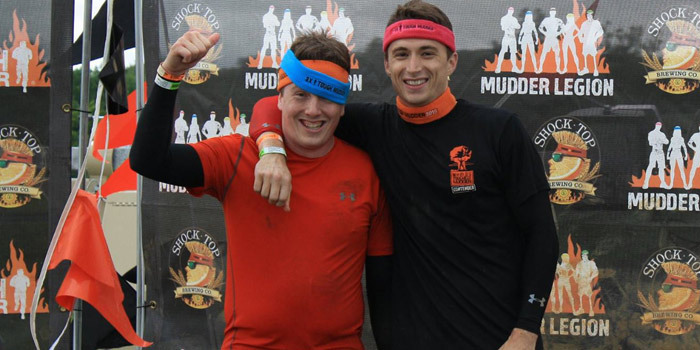 Kyle Blackwell (left) and Andrew Shultz will soon be participating in the 2015 World’s Toughest Mudder. Two local men are preparing their wetsuits, goggles and running gear for a weekend that will test them both mentally and physically. Kyle Blackwell, Warsaw, and Andrew Shultz, Columbia City, will soon be competing in arguably one of the world’s most difficult races, World’s Toughest Mudder. The race, better defined as an obstacle course, spans a grueling 24-hours. Mudders from all around the world flock to the desert outside of Las Vegas to continuously run a 5-mile course designed to test them in every conceivable way. A total of 21 obstacles span the stretch to the finish line. 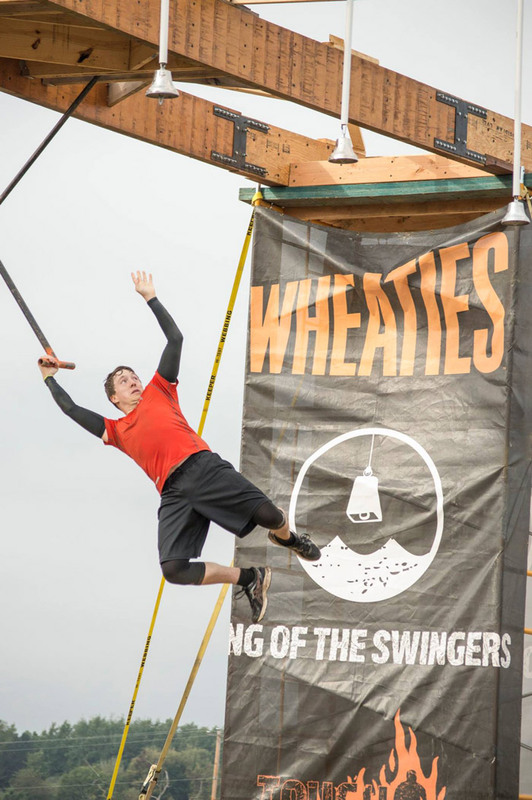 Mudders are asked to cliff dive, undergo “electric shock therapy” and much more. Many may ask why anyone would be crazy enough to intentionally undergo a course that forces you to face both pain and fear for 24 hours straight, according to Blackwell and Shultz however, camaraderie is a major drive. “My friend Kyle Wireman got me into it. It is one of those things where one person tells another person and they get involved with it. When you do more of them, you always want to do more and get more people involved. It seems like Kyle is hooked on it now as much as the rest of us have become,” stated Shultz with a smile. “It really is good way to experience camaraderie and community. You get to see the same people over and over. And every course is different,” agreed Blackwell. Blackwell reaches to ring a bell before diving into water below. Though Shultz has braved the course once before, this will be Blackwell’s first time traversing the obstacle filled terrain. Blackwell noted his trek to WTM hasn’t been an easy one. He began training initially to become fit with an end goal of completing a normal 10-12 mile Tough Mudder. After shedding 40 pounds and undergoing months of rigorous training, Blackwell has completed four Tough Mudders. Shultz noted the two have completed Mudders together in four different states this year: Ohio, Michigan, Illinois and Kentucky. 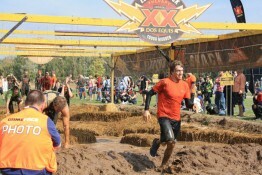 Shultz has run Tough Mudder courses a total of 10 times, completing eight different events with multiple laps in Michigan. When asked what the two men were most nervous about, their answers varied. Last year, Shultz and Wireman’s run was cut short by a sandstorm that ripped away half of the tents set up for guests by their pit crews. The two men made it 20 miles before having to seek shelter from the winds, which Shultz estimated over 45 mph. This year, the three men are hoping to beat the 20 miles they finished last year and be better prepared for the elements. 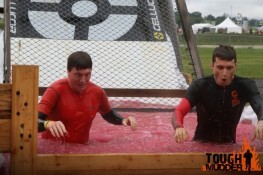 The two wade through freezing waters at a previous Mudder event.